The patriarch was added to a government-backed doxing website after referring to nationalist politicians as enemies of all Slavs. It seems Ukrainian nationalistic politicians and religious schismatics didn’t appreciate that he referred to them as enemies of all Slavic peoples, as The Duran previously reported. “Anyone who helps the Ukrainian schismatics is an enemy not only of the Russian Church and the Russian world, but also of all Orthodox Slavic nations and the entire Orthodox world,” His Holiness Patriarch Irinej of Serbia declared while receiving an award from the International Public Foundation for the Unity of Orthodox Peoples on May 23 at Moscow’s Christ the Savior Cathedral. The canonical Ukrainian Orthodox Church, a self-governing part of the Russian Orthodox Church, does not back the bid to legitimize the schismatics who are helping to drive violent wedges into Ukrainian society. We should not think that the population of Donbass is innocent in these sufferings. It is guilty! And it must expiate its guilt by torment and blood. Whereas Patriarch Irinej of Serbia was focusing on the unity of the Orthodox faith that itself has been a central point of union between Slavic peoples for over a millennium, the Ukrainian government’s response demonstrates a focus on the Ukrainian nationalistic ideology that, in fact, divides the Ukrainian people from their Slavic brothers, and indeed, from themselves. It is ironic that the government’s site is entitled “Peacemaker,” given that Ukrainian nationalism and the politicians who tout it are often backed by violent terrorist groups such as “C-14” and “The Right Sector,” whose members aren’t afraid to preach their ideology with their fists, or worse. They often turn on their Ukrainian brothers and sisters, attacking the clergy and faithful of the canonical Church, and seizing or destroying their parishes. While the site declares the Mirotvorets Center to be an independent NGO, it isn’t hard to establish the many links. The site was launched in December 2014 by politician and activist George Tuka, as he announced on his Facebook page. Tuka served as the governor of the Luganks Oblast from 2015-2016, and has served as Deputy Minister for the Ukrainian Ministry of Temporarily Occupied Territories and IDPs since April 2016. The Mirotvorets Center is led by Roman Zaitsev, a former employee of the Lugansk branch of the Security Service of Ukraine. Further, the site is curated by the Security Service of Ukraine and promoted by Anton Gerashchenko, an MP and aide to the Interior Minister, according to the International Business Times. It is sadly typical that the Serbian patriarch would be lumped in with “pro-Russian terrorists” and deemed a danger to Ukraine’s national security for his views on Ukrainian-nationalism-fueled religion. If you’re not gung-ho about Ukrainian schismatics being legitimized overnight, just so they can be separate from the Russians they so hate, you must be under the evil sway of the evil Kremlin! The Ukrainians can’t see any other way to process the patriarch’s words. They can’t seem to fathom that his focus is on something other—on the unity of the Church and its people. Also included is his birth name, birthdate, his position as patriarch of the Serbian Church, the date of his election to the primatial throne, and the full text of his offending quote. In a sense, he is lucky—much more sensitive information has been publicized on the site about other people. Ukrainian author Oles Buzina and former Verkhovna Rada Deputy Oleg Kalashnikov were assassinated just days after the site published their home addresses in April 2015. This site contains data on more than 25,000 men. More than 300 of them are either arrested or killed. So why should I worry about some two lowlifes who are guilty of war? 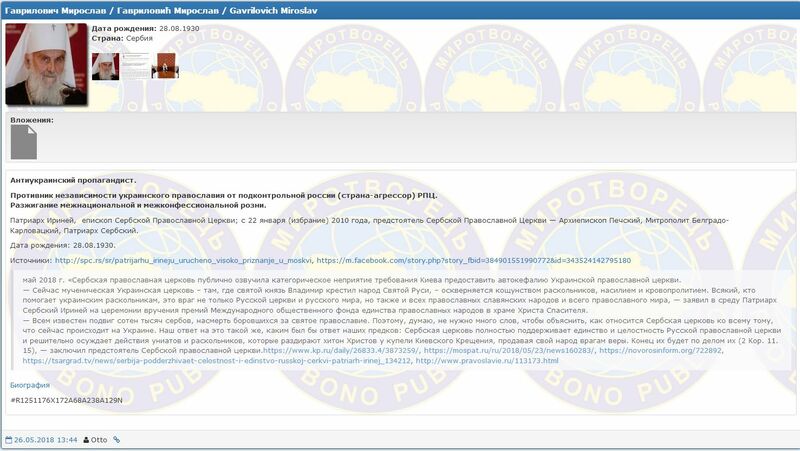 In May 2016, the site published the phone numbers, email addresses, and addresses of 4,508 journalists and media members from around the world who had worked in Donbass, and therefore, as Mirotvorets claims, “cooperated with terorrists.” Although the information was obtained by hacking into the databases of the Ministry of State Security of the Donetsk People’s Republic, the Security Service of Ukraine declared the site had violated no laws. The names on the list include people working for respectable outlets, such as news agencies AFP, AP and Reuters, broadcasters BBC, CNN, CCTV, Deutsche Welle and Al Jazeera, newspapers, including the New York Times, Gazeta Wyborcza and Kyiv Post, news websites Vice News and Daily Beast and many others. Several of the journalists began receiving threats via phone and email after the site went public with their personal information. Anton Gerashchenko, an MP, aide to the Interior Minister, and high-ranking Mirotvorets supporter has called for the leaking of the personal data of Russian soldiers fighting in Syria so that ISIS could find and kill them. And it all comes full circle when we learn that, in return for demonizing anyone who stands in the way of the illegitimate legitimizing of religious schismatics, Mirotvorets has been given high praise by the likes of “Patriarch” Philaret himself. Congratulating and “blessing” the team behind the site on Counter-Intelligence Day, December 27, 2017, he bestowed a medal “For the sacrifice and love for Ukraine” upon them. It remains to be seen if, how, and when Patriarch Irinej will respond to his inclusion on the doxing website. But then again, it’s hard to imagine that it’s something worth the hierarch’s time.